Congratulations! This is a special time in your life. Marriage is created by God and is a“lifelong union of one man and one woman” (Luther’s Small Catechism with Explanation, p. 79). All weddings performed at St. Luke’s Lutheran Church and/or by their pastor(s) will be between one man and one woman who are professing Christians (2 Corinthians 6:14a). 4-5 Premarital Counseling sessions with the pastor. Regular worship attendance both before and after the wedding. The called pastor(s) of St. Luke’s will officiate at all weddings at St. Luke’s. Other pastors of The Lutheran Church – Missouri Synod may preside at weddings with the pastor’s and elders’ approval. For more information, click on St Luke’s Wedding Handbook. 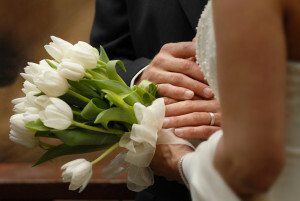 Click here for more information about Marriage-Affirmation-Statement, Marriage and Human Sexuality and Marriage Policies for LCMS Member Congregations.